Here is a collection of discoveries and events that happened after 'Phoenix Return' was published in January 2000 and which seem to corroborate the channelled information. Please note that this section does not cover the huge amount of information contained in the text which had to be researched once the transcription was complete. These nuggets are highlighted in the main text in green and linked to reference sources. November 2018 : Report published in The Guardian regarding a huge meteor crater found under the Greenland icecap, dating to 12000 years ago - which roughly correlates with the date given by Plato for the destruction of Atlantis, the Younger-Dryas cooling period, the formation of an extensive nanodiamond layer in the northern European and American sediment, the date suggested by Graham Hancock in his work and the date given in 'Phoenix Return'. August 2017 : Please see the section 'Iona' on the main menu for a summary of the research done regarding the possibility of an Atlantean temple on the island. January 2016 : Not proven yet but excitingly close is the finding of a large thermal anomaly in the northern face of the Great Pyramid at Giza by Cairo University's Scanpyramid project, which they say may represent a hidden passageway. See here for this prediction in 'Phoenix Return' on 2nd May 1999. 1. In March 2015, New Scientist published an article regarding the interception of unusual signals 'Fast Radio Bursts' from space, starting in 2001. Ten have been received so far, the latest in 2014 and they seem to be from an artificial rather than a natural source. This interception was predicted in 'Phoenix Return' on 22nd April 1999. 3. In 2012 a huge buried complex was discovered at Abu Sidhum, was discovered by an American lady Angela Micol using Google Earth. Reported in the Daily Mail and online, this anomaly fits with the location described in 'Phoenix Return' on the 10th May 1999 of a lost Temple of Horus. A common feature throughout the writings is the mirror image reversal of compass directions as explained in The Process section of this site. If one substitutes 'East' for 'West', Abu Sidhum fits the location described although the site is yet to be excavated so not a full 'Hit' yet but intriguingly close. 4. Weather on western edge of central Atlantic Ocean to serve as a marker of climate change - 26th May 1999 . Take a look at the bar chart for the incidence of named storms and hurricanes in the Atlantic from 1851 to 2012 here. This roughly correlates to the Wilkes Land mass concentration, centered within a ring-like structure identified by radar, first reported in 2006 (though a possible impact crater was proposed to exist back in 1962 given the data suggesting a large negative gravity anomaly but this was theoretical and did not include the outer ring reported in the 2006 paper). 7. The warning about a close encounter with 'Asteroid Mark IV' P3 10th February 1999. Asteroid Apophosis 2004 MN4 was not discovered until December 2004. It is unlikely to hit earth we are told by experts but it will come very close. NASA run a 'Near Earth Object Program' on the lookout for 'Potentially Hazardous Asteroids' as there is a real risk of being hit by something we haven't discovered yet. 8. A paper in the September 2014 edition of the Journal of Geology (click here) by Kennet et al states that "We conclusively have identified a thin layer over three continents, particularly in North America and Western Europe, that contain a rich assemblage of nanodiamonds, the production of which can be explained only by cosmic impact," Kennett said. "We have also found YDB glassy and metallic materials formed at temperatures in excess of 2200 degrees Celsius, which could not have resulted from wildfires, volcanism or meteoritic flux, but only from cosmic impact." The paper concludes 'Of all the proposed hypotheses, a cosmic-impact event at the onset of the YD cooling episode is the only hypothesis capable of explaining the simultaneous deposition of peak abundances in NDs, magnetic and glassy spherules, melt-glass, platinum, and/or other proxies across at least four continents (≈50 million km). The evidence strongly supports a major cosmic-impact event at 12,800 ± 150 cal BP.
' The Atlantic seaboard consists of two interlocking coastlines. We see deficit in the mid-Atlantic region caused by the loss of the landmass known in ancient times as Atlantis. The suggestion of the location of Atlantis in the mid-Atlantic is not a new one - for example see Kircher's map of 1669 and Plato in Timaeus and Critias in 360 BC and the question of whether the sudden melting of Earth's ice cover in around 12,900BC was caused by collision with a comet, the so-called Younger Dryas Impact Hypothesis, has been debated since it was first published in 2006. 'I’m going through that eye now into a different landscape – it’s sort of hilly with trees – ‘We’re back in England now’ they’re telling me, wherever I’ve been before. There's lots and lots and lots of forests and woods and trees but there’s not many people around. They’re showing me a river sweeping in from my right hand side … it’s not a river! It’s the firth Moray Firth, I think it’s the Moray Firth – the bit that separates England from Scotland, whatever that’s called – it’s that bit of water, I recognise that…and the water has swept right across some lowland and now it’s continuous with the Irish Sea on the other side of the coast … very strange! I’m going to ask them why they’re showing me this … mmm … blimey! The answer that I’m getting is that there’s going to be a separation between the major components of the British Isles, between England and Scotland and less so between England and Wales but there’s still going to be a band of water, but more scattered, between England and Wales than this vast swathe of water between England and Scotland. 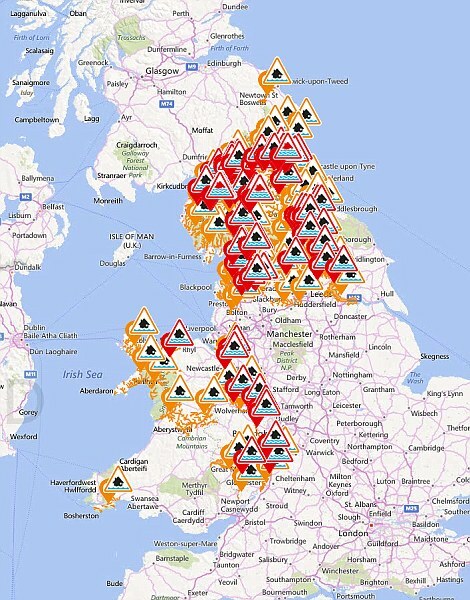 Now look at the BBC map showing the flooded areas following Storm Desmond here. As mentioned in the 'Process' section, several dates for events did not materialise as predicted (see 11th June 1999 which could be construed as predicting the Boxing Day Tsunami of 2004 or not, depending on your degree of scepticism). See also the mention of war in Greece and Italy on 26th April 1999. Is this yet to come? Hopefully not.